It’s the 50th Anniversary commemoration of the wall of respect and we’re here to see an exhibition at the Chicago Cultural Centre that documents the Black Power movement. The exhibition displays photos, letters, books and poems. In 1966 the slogan “Black Power” energised the Black Liberation Movement. Chicagoans organised to advance a new Black aesthetic and promote black consciousness through the creation of art. One result was the Organisation of Black American Culture, or OBAC being born. OBAC were a collective of multi disciplinary artists that set out to create a public mural that celebrated black heroes. Created through a collaborative process the artists and the community would chose who would be painted on the wall by using OBAC’s definition – “any Black person who honestly reflects the beauty of black life and genius in his or her style” – and who demonstrated originality and social consciousness for other less fortunate black people. The wall an act of self-determination – an act of celebration. Discussions of art and politics spread throughout the city. The wall became a place for performance, debate, poetry and politics; it was where Chicago’s Black Power movement came to celebrate. This exhibition a place to reflect. It blows me away. I’ve NEVER seen a Cultural Centre in the UK used like this. I can’t even imagine – a building as grand at the National Museum – for the people and used by the people. I’m in Chicago for the next week collaborating with an incredible youth theatre called Albany Park Theatre (APTP). 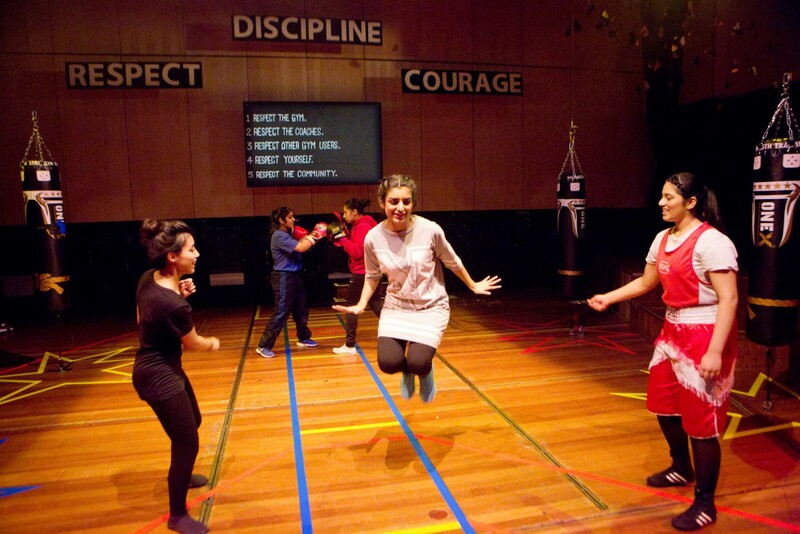 APTP are a company that share the mission and values of Common Wealth, working multi-disciplinary and in non-theatre spaces they create shows based on interviews that inspire and build social change. David, the Co-Founder of APTP came across Common Wealth online – finding No Guts, No Heart, No Glory and emailing us out of curiosity and a need to connect. One year later after a Common Wealth workshop and a number of mega Skype calls and here we are, Chicago! working on a new play with a 30 strong ensemble surrounded by an incredible creative team with a hunger to push things forward. Over the next couple of weeks I’ll be documenting my time here – sharing experiences, stories and thoughts on the development of our new show and the city it’s being created in. Already I’m inspired by the wildness of this politically charged city. Albany Park where we’re working is the United States’ third most diverse neighbourhood, with people from Latin America, Asia, Africa, and Eastern Europe. A wealth of culture and knowledge. At Albany Park there’s so much hope and I can’t wait to share it with you. Here’s some links if you fancy digging deeper. Previous Post« Who gets ‘developed’? The diversity question: who is and isn’t able to become a professional artist, and how can we change that?